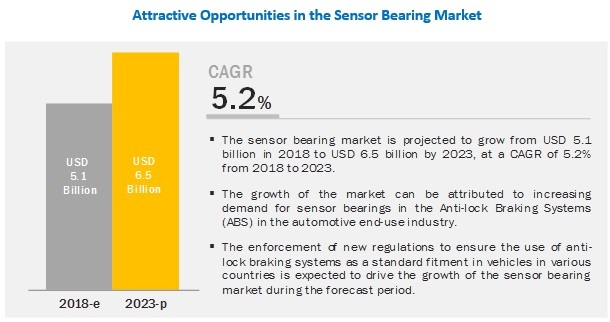 [179 Pages Report] The sensor bearing market is estimated to grow from USD 5.1 billion in 2018 to USD 6.5 billion by 2023, at a CAGR of 5.2%. The major factors driving the sensor bearing market are increasing demand for sensor bearings from end-use industries, such as automotive and transportation, and the enforcement of stringent regulations related to the mandatory installation of ABS systems in cars in various Asia Pacific and European countries. The demand for sensor bearings used to measure the speed of rotating shafts and wheels is increasing in the automotive industry. Presently, over 90% vehicles that ply on roads are equipped with wheel speed sensors. Additionally, the US and some member countries of the European Union have made the use of ABS and ESC systems mandatory in passenger cars since 2011 and 2014, respectively, thereby leading to the increasing demand for sensor bearings. ABS control systems determine the requirement of using anti-lock braking. High demand for vehicles with ABS in developed countries is leading to the growth of the ABS segment of the sensor bearing market. Moreover, the US and some member countries of the European Union have also made the use of ABS and ESC systems mandatory in vehicles since 2011 and 2014, respectively. This is also leading to the growth of the ABS segment. The sensor bearing market in the Asia Pacific is expected to witness significant growth on account of the high demand for the sensor bearings from the growing automotive industry. The Asia Pacific region has emerged as a hub for automotive production, with OEMs and suppliers setting up production facilities to cater to the growing demand for automotive vehicles. The Asia Pacific region has also witnessed an increase in population and income levels, which has subsequently raised the demand for automobiles. Thus, leading to the increasing demand for sensor bearings. Key players in the market include SKF (Sweden), Schaeffler Technologies AG & Co. KG (Germany), NTN Corporation (Japan), Timken (US), NSK Corporation (Japan), JTEKT Corporation (Japan), ABB Group (Switzerland), Mageba SA (Switzerland), BRTEC (China), ABB Group (Switzerland), Fersa Bearing SA (Spain), and Nachi Europe GmbH (Germany). These players have expanded their geographical presence through new product launches, acquisitions, and expansions. In June 2018, SKF and National Renewable Energy Laboratory (NREL) entered into a three-year collaboration to study wind turbine drivetrains. Sensors installed in the bearing will be installed to measure gearbox condition and shaft bearing. The project will be an ideal opportunity for SKF to showcase its expertise in the wind energy industry. In January 2018, SKF and Koncar KEV signed an agreement for the supply of bearings, axle boxes, and associated equipment for its latest low-floor electric and diesel-electric multiple unit trains. What are the upcoming industry applications for sensor bearings? What is the impact of changes in government policies on the sensor bearing market? What is the total size of the sensor bearing market? What are the different applications of sensor bearings? The study involved 4 major activities to estimate the current sensor bearing market size. Exhaustive secondary research was undertaken to collect information on the market, peer market, and parent market. The next step was to validate these findings, assumptions, and sizing with industry experts across the value chain through primary research. Both, top-down and bottom-up approaches were employed to estimate the complete market size. Thereafter, market breakdown and data triangulation procedures were used to estimate the market sizes of segments and subsegments. As a part of the primary research process, various primary sources from both, supply and demand sides were interviewed to obtain qualitative and quantitative information for this report. Primary sources from the supply side included industry experts, such as CEOs, vice presidents, marketing directors, technology and innovation directors, and related key executives from various key companies and organizations operating in the sensor bearing market. Primary sources from the demand side included directors, marketing heads, and purchase managers from end-use industries. Following is the breakdown of primary respondents. The industry’s supply chain and market size, in terms of value, have been determined through the primary and secondary research processes. After arriving at the overall size from the market size estimation process explained above, the total market was split into several segments and subsegments. To complete the overall market engineering process, and arrive at the exact statistics for all segments and subsegments, data triangulation and market breakdown procedures were used, wherever applicable. The data were triangulated by studying various factors and trends from both, the demand and supply sides. In addition to this, the market was validated using both, top-down and bottom-up approaches. SKF (Sweden), Schaeffler Technologies AG & Co. KG (Germany), NTN Corporation (Japan), Timken (US), NSK Corporation (Japan), JTEKT Corporation (Japan), ABB Group (Switzerland), Mageba SA (Switzerland), BRTEC (China), ABB Group (Switzerland), Fersa Bearing SA (Spain), and Nachi Europe GmbH (Germany). This research report categorizes the sensor bearing market, based on functionality, application, end-use industry, and region, forecasting revenues as well as analyzing trends in each of these submarkets.